Take photography for instance. Its basic elements were discovered centuries ago, but the first usable photograph is said not to have been produced until the 1820's. But not until 1865 did Congress extend copyright protection to photographs. And even then, there was controversy. In the 1880's, famed lithographer Napoleon Sarony (1821-1896) began making photographic portraits of the leading men and women of the American theatre. Without Sarony's permission, a company called Burrows-Giles Lithography began selling copies of one of Sarony's 1882 portraits of Oscar Wilde. Never mind the fact that each copy, like the original, bore the legend, "Copyright, 1882, by N. Sarony." Sarony sued. Burrow-Giles Lithography Co. v. Sarony, 111 U.S. 53 (1884). The alleged infringer argued that the 1865 act extending copyright protection to photographs was unconstitutional. The basis for this argument was that the Constitution gave Congress the power secure "for limited times to authors and inventors the exclusive rights to their respective writings and inventions." Burrows-Giles, the infringing company, asserted that a photograph was neither a "writing" nor an "invention," and so could not be protected by copyright or patent. Indeed, the defendant argued, a photograph could not possibly be a writing, it merely "being a reproduction, on paper, of the exact features of some natural object or of some person, . . . of which the [photographer] is [not] the author." "Oscar Wilde, No. 18, by Napoleon Sarony. Where would copyright law be if Sarony hadn't dressed Wilde?" The United States Supreme Court reviewed the history of the copyright laws, noting that the first copyright act in 1790, referred only to maps, charts, and books. In 1802, Congress amended the act to include engravings, etchings and "historical prints or other prints." The Court astutely observed that "[t]he only reason why photographs were not included in [the copyright act of 1802] is, probably, that they did not exist . . . ." Probably. The Court eventually came to the conclusion that the Constitution is broad enough to cover an act authorizing copyright of photographs, "so far as they are representative of original intellectual conceptions of the author." Now this last phrase was very important to the Court's collective 19th century mind. The Court hinted that maybe not every photograph could be the subject of copyright: only those "in which there is novelty, invention, originality" perhaps might be properly copyrighted. 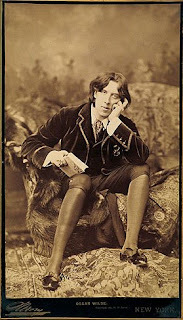 Thus, the Court found it important that Sarony had posed Oscar Wilde in front of the camera, "selecting and arranging the costume, draperies and other various accessories in said photograph, arranging the subject so as to present graceful o outlines, arranging and disposing the light and shade, suggesting and evoking the desired expression . . . ." These facts, said the Court, showed the photographer to be an "author," that is, "he to whom anything owes its origin;" and the photograph to be "an original work of art, the product of the [photographer's] intellectual invention," and therefore eligible for copyright protection. We can almost laugh at the reasoning applied to photographs in the early days of copyright. But in many ways, new media and old media remain as perplexing to us today. Sonny Bono and the Naked Orphans! This digital age has opened so many opportunities for the creative use of many media. Users want, among other things, to digitize and distribute older works. They want to incorporate existing works into new ones. Scholars, archivists,historians and genealogists want to use existing works in their research. But these new uses drive potential users right into the chilly Dickensian darkness of a creative works "orphanage." "Orphan works" are copyrighted works whose owners are difficult or even impossible to locate. Books, film, music, all may be orphaned. And this is a particular problem with photographs, since it often has been difficult to affix permanently to them information about authorship and copyright. The "orphans" are a problem in part because the Constitution itself seems to have two goals with respect to intellectual property. The copyright and patents clause says that Congress is authorized "to promote the progress of science and useful arts, by securing, for limited times to authors and inventors the exclusive right to their respective writings and inventions." On the one hand, "promoting the progress of science and the useful arts" is achieved by giving authors and inventors some economic incentive to create. On the other hand, such promotion is also accomplished by limiting the terms of exclusive rights, so that others can create new works which may rely on or incorporate older works. But potential new creators won't touch orphaned works because of the potential liability for infringement. Originally, the "limited time" for a copyright was 14 years, renewable for 14 years. By 1909, the term had become 28 years, renewable for 28 years. But in 1976, Congress changed the whole scheme: copyrights would now last through the life of the author plus 50 years. Finally, in 1998, Congress extended that to the life of the author plus 70 years. The law was named for the then recently deceased Sonny Bono, a singer-songwriter of some notoriety in the 1960's, who at the time of his tragic demise happened to be a Congressman from Southern California. The Sonny Bono Act exacerbates the problem of orphan works. The extension of the copyright terms keeps material from entering the public domain for a longer period. Productive and beneficial uses of a work maybe prevented because of the difficulty of locating a copyright owner decades after the death of the author. This is especially so since the 1976 Act also no longer requires registration with the copyright office. Again, these are particularly significant issues with photographs, often because photographs carry little or no evidence of authorship. In the digital age, until very recently, there's been no convenient way to permanently affix authorship information to an image. (Hence, the "naked" orphan!). And all of these issues have been magnified by the proliferation of digital copies and websites. If you're a potential user of orphan material, how much searching must you do in order to be reasonably certain that there is no copyright? There's presently no answer to this; as a result many potential users simply avoid such use, which, it is argued, inhibits creativity, stifles public understanding of certain works, and forces many valuable works into obscurity. There are two bills introduced last month (April) before Congress to deal with the orphan works problem. Both bills limit the remedies against an alleged infringer if the alleged infringer performed a "diligent effort" to identify the copyright owner. There are some requirements for a "diligent effort." Two other requirements beyond the search are that the alleged infringer files a Notice of Use (of the orphan work) with copyright office and places a symbol or other notice of use (to be determined by the Copyright Office) with the infringing work. The bills also require the Copyright Office to certify electronic databases to facilitate the search for pictorial, graphic and sculptural works that may be copyrighted. It appears that these databases would be privately (i.e., commercially) operated. The other side to the story of course is the creators' viewpoint. Many photographers, graphic artists, and illustrators are adamantly opposed to the bills, saying there will be rampant infringement with a "get out of jail free" card. There are valid issues, and some powerfully awful politics, on both sides here. If I thought the picture of the little girl above might be copyrighted, I would be very cautious about using it here or anywhere. Under one version of the proposed law, however, if I made a diligent search for the copyright owner, and didn't find anything, I might go ahead and use it. If the photograph was in fact still subject to copyright, then the remedy against me might be limited to reasonable compensation for the use. Indeed, if I am a nonprofit educational institution, museum, library, or archives, or a public broadcasting entity, and my use is for noncommercial, but primarily educational, religious, or charitable purposes, then I might not be held to pay any compensation at all. To qualify for that exemption, I must have made "an expeditious good faith investigation" of the claim of copyright and ceased my use of the copyrighted matter. So what about our little girl? Her name is Mabel Emily Micheau and she was born on August 4, 1892. She was the daughter of George Micheau and Mary Emma Roy, of Prairie du Rocher, Illinois. 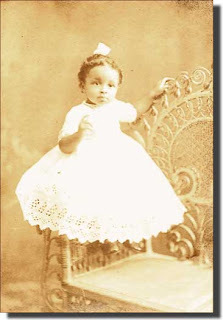 I'm not sure exactly when the photograph was made; perhaps it was in August of 1893 when according church records, she was baptized. Clearly, this little girl is not more than two years old. Assuming the photograph was subject to copyright in 1893 (see Burrows-Giles v Sarony discussed above), the term at that time was 28 years, renewable for 14 years. In 1909, this was extended to 28 year renewal. So for a photograph taken in, let's say, 1893, the copyright would have expired not later than 1949. I have no idea who the photographer was and it would be fairly difficult, though not impossible, to figure that. But, this photograph is in the public domain; our little girl is not an "orphan," she belongs to us all. The original of this photograph is owned by Mabel Emily Micheau's now 85 year old niece. Does the niece's ownership create a copyright enforceable by her? No. Copyright springs from the creative act and placing the creation in fixed form. Her niece has no greater copyright in the photograph than she has in a copy of Gone With The Wind. On the other hand since she does own the original, the niece has property rights in the original. She can prevent someone from making copies of her original; she can keep the original locked in a vault; she can prohibit its defacement or destruction. She graciously allowed me to scan it. Could this image be copyrighted today in its present form? Copyright protects original works of authorship that are fixed in a tangible form. Anyone attempting to copyright this image as it is would fail the "original work" test. Suppose however, someone restored the photograph. Is the restored image subject to copyright? The restored image might be considered a "derivative work," that is, one work that is based on (or derived from) one or more already existing works. A derivative work is copyrightable if it includes what the copyright law calls an “original work of authorship.” To be copyrightable, a derivative work must be different enough from the original to be regarded as a “new work” or must contain a substantial amount of new material. Making minor changes or additions of little substance to a preexisting work will not qualify the work as a new version for copyright purposes. The new material must be original and copyrightable in itself. A photographic restoration is probably not copyrightable. Any other user may scan this image and place it on-line; but they may not claim copyright in it just because they scanned and nothing further. [Caveat: there are copyrights in some arrangements, anthologies, compilations, etc. And of course, either I or footnoteMaven--or perhaps both of us-- own the copyright in this blog post which includes the photograph]. So Dear Collectors, the next time you're tempted by a lovely photograph in an antique shop, you should ask yourselves "Is she a naked orphan?" 1. Photograph of Mabel Emily Micheau, taken Prairie du Rocher, Illinois; photographer and date unknown; original in the possession of Ottie Micheau Perkins, St Louis, Missouri. "Craig Manson is an active member of the California Bar. This article is for educational purposes only and is not intended to substitute for specific legal advice. If you have a legal problem in the subject discussed, you should contact a lawyer in your local area." You've got me thinking again Craig! This is an excellent article that raises many questions and answers a few too. I wasn't thinking I needed something new to ponder today but now I've got something just the same. Orphans. Thanks for sharing this information Craig! Excellent, excellent post! This was an eye opener for me. No, I meant it just as I wrote it! :)! Most interesting and educational. Thanks so much Craig for this "powerfully wonderful article." And thanks Maven for hosting this Friday column. I can not thank you enough for this brilliant article. It is so well researched and written, as always. You have made a valuable contribution to the family history and photographic world. And, I love the title! Thank you, fM! 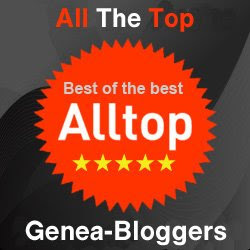 It was indeed an honor and a pleasure to guest blog here today. I'll bet Sonny's enjoying his newfound association with the naked orphans! What an image that conjures up . . . Thanks for a very interesting article. Like Jasia, I also have lots to consider. "OSCAR WILDE, SONNY BONO AND THE NAKED ORPHANS" has to be about the best headline ever...there's no way anyone could pass this by without a look! Thank you so much for this enormously informative post - I can't tell you how much i enjoyed reading it. I am going to bookmark it so that I can refer to this many times. Awesome post, and one which is hitting home for me at this particular time! I suspect I'll need to re-read it a few times, but I think it did answer a question or two! Thanks! As I'm a photo restorer, you certainly have me thinking about what I do. Since the byproduct of what I create is "...probably not copyrightable..", I'm OK with that. I have - and do - take pause when a photo has 'Do Not Copy' stamped on the back. Does this mean that if the original photographer did a crummy job and the customer wants me to correct/retouch it, we have to seek permission from him? Your post is one that I'm going to revisit many times.